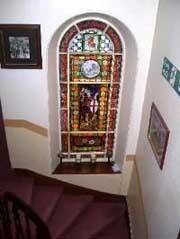 The Park Hotel is a large detached Victorian villa and was formerly the home to the Provost of Macduff. It is situated clost to war memorial in Macduff, which is around 700 feet above sea-level and it has spectacular sea views. There are very large private parking facilities. "The Park" is a friendly guest house and warmly welcomes all of our guests and also their friendly pets. Macduff a very scenic part of the county of Banffshire, a little off the beaten track but well worth a visit. "The Park" is the place to be in Macduff and you will always be given a very warm welcome. Whatever the occasion, we look forward to seeing you and small parties can be catered for. There are five beautifully appointed letting bedrooms, all are centrally heated, en-suite, with tea/coffee making facilities and televisions. Each of the bedrooms have been individually furnished to a high standard. There are one single room, one twin room, one double, one small family room (which can easily double as a twin bedded room) and a family room (with one double ded and two single beds). Each room is individually heated for your own comfort, with all of the functionailty you would expect to find. The hotel has a fully licenced bar, complete with up to date juke box (30,000 tunes), pool table, darts and fruit machine. The hotel also hosts karaoke and discos, usually at weekends and is also one of the few local establishments to frequently host live music. For more information on upcoming events, click on the "entertainment" tab on the left. Despite accommodating all of these modern attractions, The Park has ensured that its natural 19th century heritage has not been lost, particularly with its feature staircase and staines glass picture window.